One of the more challenging but important aspects of canine genetic testing is deciding what recommendations to make when a dog or one of its relatives are found to be at risk for (or affected with) an inherited disease. Appropriate testing recommendations for the relatives of affected dogs may be crucial for prevention of additional affected puppies and identification of other dogs that may also be at risk of disease. Recessive diseases are particularly troubling for breeders because dogs inheriting a single copy of a disease-causing mutation (“carriers”) do not show signs of the disease, but can produce puppies with the disease if bred to another carrier of the same mutation. 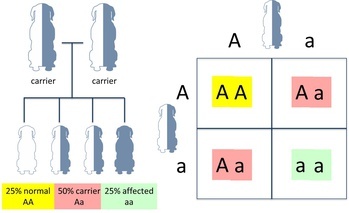 Based upon statistics, the breeding of two carriers results in a combination of all possible genotypes in their litter; approximately 25% “clear” (no copies of the mutation), 50% carriers (one copy of the mutation), and 25% at risk/affected (two copies of the mutation). Therefore, all littermates of a dog affected with a recessive disease should also be tested to understand each individual’s risk. When dealing with a recessive disease that displays variable expressivity, it would also be strongly indicated to test the parents of affected puppies as they may not yet show obvious clinical signs of the disease their puppies have inherited. Lastly, determining whether the parents have inherited one or two copies of the associated mutation is crucial in preventing additional affected puppies. Dogs carrying one copy of a recessive mutation can be safely bred to dogs which have not inherited the mutation without fear of producing affected dogs. However, it should be noted that approximately 50% of the puppies from this pairing will be carriers of the mutation. In general, it would not be recommended to breed dogs with two copies of the mutation. However, in some cases breeding these dogs to clear dogs (rather than removing them from the gene pool) should be considered to prevent loss of genetic diversity within the breed (e.g. small breed populations, high mutation frequency in the population, etc.). However, it is important to understand that 100% of the puppies from this pairing will be carriers of the mutation. If you have questions about how Paw Print Genetics can help you in your veterinary practice or if you have general inherited disease related questions, please feel free to contact us at AskUs@pawprintgenetics.com or call our laboratory at 509-483-5950 (Monday through Friday, 8 am to 5 pm Pacific time) to speak to one of our knowledgeable geneticists or veterinarians. This statement below that you had wrote in the article above within your website I just have to make sure I am understanding it correctly. In general, it would not be recommended to breed dogs with two copies of the mutation. However, in some cases breeding these dogs to clear dogs (rather than removing them from the gene pool) should be considered to prevent loss of genetic diversity within the breed (e.g. small breed populations, high mutation frequency in the population, etc.). It should be understood that 100% of the puppies from this pairing will be carriers of the mutation. Does this essentially mean that it's okay to breed a dog with 2 mutants of the affected gene and the one dog has 2 clear genes? So Affected dog/Clear Dog okay to breed but puppies will be 100% carriers? This is how I am looking at the statement? Am I right? Hi Jennifer! Thank you so much for your question. It is not typically recommended to breed dogs affected with a recessive disease because even when breeding with a clear dog, 100% of the puppies will have the mutation. Thus, increasing the frequency of the mutation in the general population and making more likely that any (untested) breeding pair could produce affected dogs. In some cases, removing every affected dog from the gene pool can severely decrease genetic diversity (overall variability of all genetic factors) in the breed to a point in which it might be better to consider keeping the affected dogs in the program. Breeds with low genetic diversity are at MUCH greater risk of recessive inherited diseases (including those for which no testing currently exists). 1. The frequency of the mutation is already very high or in the population. Therefore, if you removed every affected dog, you may significantly decrease genetic diversity. 2. Breeds with small populations that can't afford to lose genetic diversity due to removal of affected dogs from the gene pool. You are correct, however, that breeding a dog that is at-risk/affected with a recessive disease to a dog that is clear of the mutation will result in every puppy inheriting one copy of the mutation (thus, making them a carrier). None of these dogs would be affected from that single copy. However, I would not routinely breed at-risk/affected dogs unless there are extenuating circumstances that make the risks of increasing the mutation in the population less than the risks associated with decreasing genetic diversity by removing these dogs. I hope that helps. Please feel free to email me at ccarl@pawprintgenetics.com if you have additional questions/concerns.